Arist is a fairly old single-star system, consisting of a K-type main-sequence star, 7 planets, and hundreds of moons and minor planets. The system shares a surprising amount of similarity to the solar system, though more compact owing to the star's lower gravitational attraction. Despite being double the age of the solar system, the longevity of K-type stars means that Arist will still shine and remain stable for billions of years more, its habitable zone a prime location for life to thrive and develop. Arist is the lone star of the Arist system. At 0.705 times the mass of the Sun and 0.679 times its radius, Arist is a K-type main-sequence star. It houses an extensive system comparable to the solar system, though more compact. Arist has shone for 9.44 billion years, slightly more than twice the age of the Sun. Its lower mass and hence slower rate of consuming its fuel are sufficient for about another 14.5 billion years of light and warmth until it fades away at 24 billion years of age. Although the star is around 70% of the Sun's mass, its luminosity is only 17.6% of the solar system's star. Its surface temperature is also over 1000°C cooler than the Sun, at 4291°C. Acisenrind is the innermost planet of the system. It can be considered quite a close parallel to Mercury, except for its size. Acisenrind is 0.83 times the mass of the Earth and 0.957 times Earth's radius (6094 km). Due to the more compact nature of the Arist system, Acisenrind whips around its star in 10.2 days and has become tidally locked. As a result, the day side temperature is locked to 340°C, and the night side plunges to below zero and remains thus. A thin band around the terminator of the planet—where day meets night—would maintain temperatures similar to Earth. However, the lack of an atmosphere and the constant bombardment of Arist's solar wind means that Acisenrind has long lost virtually all of its water, and is hence not at all habitable. While Acisenrind is not as hot as Mercury or Venus, the closer proximity to its star means stronger solar winds, which strips away material from the planet's surface. The current rate of this mass loss is 2800 kg/s. Therefore, Acisenrind is shrinking, but at the current rate, Arist would long be a dead star before all of Acisenrind's mass is lost. Once Arist reaches the end of its life, Acisenrind will only have lost 0.03% of its mass to the solar wind. Really lets you appreciate just how big these planets are. The second planet from Arist is slightly smaller than Acisenrind, at 0.76 times the mass of the Earth with a radius of 5945 km. However, the two planets share a similar composition and their surface features are very much alike. With an orbit of 47.1 days, Acisenusuk is just far enough away not to be tidally locked but has developed a 2:3 resonance with the star. 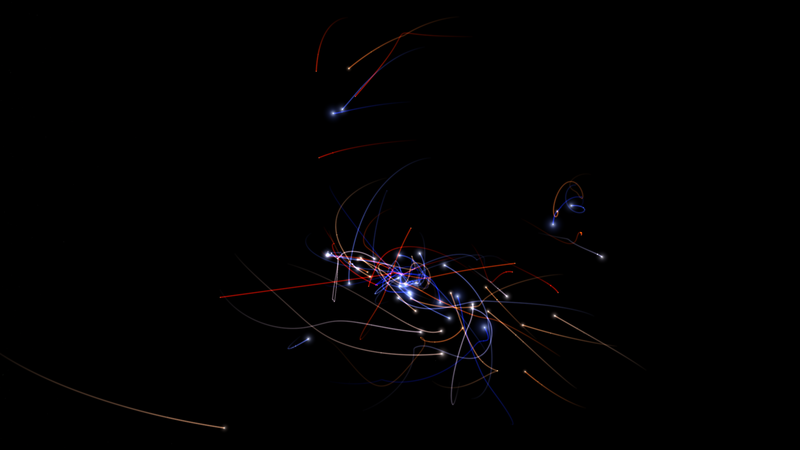 That is, for every 2 orbits around Arist, Acisenusuk rotates on its axis 3 times. The time required for one rotation is therefore 31.4 days. Temperatures on the day side are about 91°C, with night also causing a plunge into sub-zero temperatures. Like Acisenrind, Acisenusuk has lost all of its water except for some ices hidden in the depths of craters. Meet the 3rd planet from Arist, a desert world on the inner edge of the habitable zone—Jasusbula. Slightly more massive than Earth, the planet is covered in shifting sands, dunes, and arid plateaus. These clouds are deceitful—for they contain very minimal water, but a number of other substances. 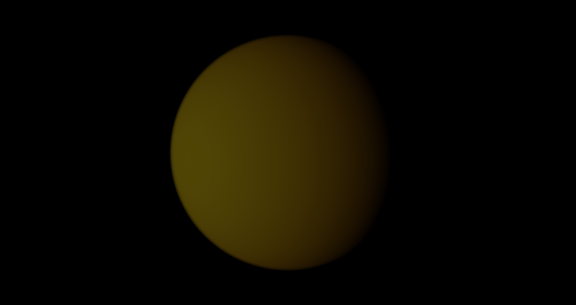 They should not be blue, but Universe Sandbox ² does not yet support changing atmosphere colour and atmospheric composition, and so I've had to make do with what I had. In the ancient past, liquid water did indeed exist on the surface of Jasusbula, the evidence being a number of dry riverbeds and valleys carved by water. However, at the inner edge of the habitable zone, water was not exactly plentiful in the first place. 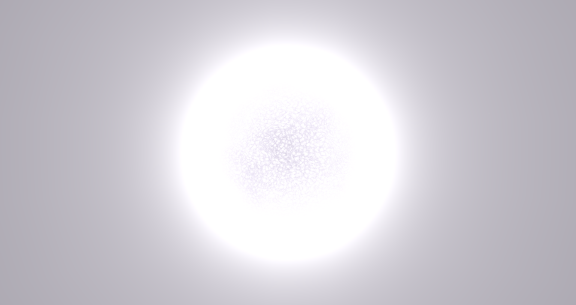 On top of this, Arist was also much cooler and less luminous in its first billion years or so of its life. Stars gradually increase their luminosity as they age. Therefore, as time passed, Arist gradually increased luminosity, meaning a greater amount of energy and solar wind hitting Jasusbula, causing increased water loss. Over the next few billion years, surface water gradually disappeared from the planet, rendering the surface quite inhospitable. Some water has been able to avoid the fate of being stripped from the planet. These reservoirs are now trapped underground in subterranean lakes and rivers. It is to the credit of the planet's magnetic field that no more of the water has been lost to the solar wind. Jasusbula still retains a molten core and has a fairly fast rotation rate. One day here is 3.32 Earth days. As a result, a magnetic field was able to develop and divert a portion of the star's charged particles, which are capable of blasting water away from the planet. If not for the magnetic field, the water on Jasusbula would certainly have been lost much faster, not to mention that a greater portion would have been lost. Would life be able to survive in Jasusbula's underground water reservoirs? Whether it may or not, an advanced civilisation is unlikely to evolve here. 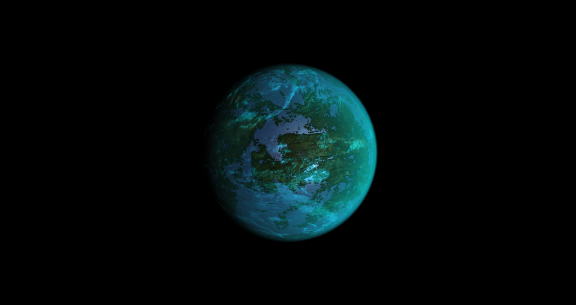 Situated in the middle of Arist's habitable zone lies Trosuslia, a relatively small Super-Earth weighing in at 2.23 Earth masses and a radius of 8089km. In contrast to Jasusbula, Trosuslia is the only planet with liquid water oceans, as well as life evidently on its surface. Though it is also a blue planet, it does not share a lot of similarities compared to Earth. A day on Trosuslia is about 2.5 Earth days. Seasons are a little more than half as long as our home planet. New human arrivals would have to take some time to adjust to the higher gravity. With an atmosphere that is 143% as heavy as Earth, living in a world with higher atmospheric pressures would also take some getting used to. Only the average temperature is relatively unchanged compared to the Earth. Trosuslia's average surface temperature is 16–17°C, compared to Earth's 15°C. While this may not seem like a lot, if Earth's average temperature is 1°C warmer than it is now, sea levels would rise by 6 metres, swamping many low-lying areas. Taking this into account, Trosuslia, therefore, does not have extensive ice caps. The large mass of Trosuslia allowed itself to sweep up most of the water present in the habitable zone during its formation. Its gravity well also attracted many small bodies containing water that was sent towards the inner Arist system by the gas and ice giants in its early days. A greater amount of its surface is covered by water compared to Earth, and it is not far from being an ocean planet with no landmasses. The high gravity of Trosuslia means that mountains cannot grow very tall before collapsing on themselves, and therefore much of the surface is covered by low-lying archipelagos. Although there are no signs of advanced civilisations on Trosuslia, life has most definitely taken a foothold. The low-lying archipelagos are dominated by lush forests and plains, providing support to a complex and diverse biosphere. Even though Trosuslia is over twice as old as the Earth, life has had a difficult time emerging due to a multitude of severe extinction events in much of its history. It's large gravity well attracts more potentially hazardous asteroids capable of inducing such extinctions. The high mass and size of Trosuslia also mean that there is much more remnant heat in its interior than Earth, leading to periodic planet-wide eruption events, throwing up dust and blocking the star's light. It was only after about 6 billion years after its formation that impact events were not so frequent and eruptions were not so widespread. After this time, unicellular organisms were finally able to flourish for extended periods. They did exist before this time but kept experiencing extinction events that prevented them from developing further. At around 8.5 billion years of age, the first multicellular organisms appeared in the oceans. At 8.9 billion years old, life finally made the move onto land. Now, at 9.44 billion years, both land and sea house an extensive array of biota, with their complexity and evolution showing no sign of slowing down lest another major extinction event should occur. Like the Earth-Moon system, a relatively large moon also orbits Trosuslia. However, whereas Earth is 81 times more massive than the Moon, Trosuslia is 206 times as massive as its companion—Trosuslia I. It is believed this moon also formed via a gigantic collision early in Trosuslia's history. On Earth, the Moon has a stabilising effect on its axial tilt, stopping the Earth from tilting erratically and keeping the climate relatively level. Although Trosuslia I is much less massive compared to its orbital parent, it also achieves the same effect, but to a lesser extent. Compared to the monthly orbit of our Moon, Trosuslia I orbital period is only about 11 days. As a result, it appears larger in Trosuslia's sky than the Moon appears in Earth's sky, and is responsible for somewhat more prominent tides on the ocean planet. 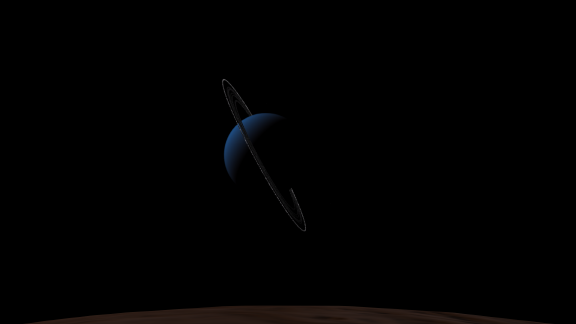 Behold the first gas giant of the Arist system—Dinuru. Though it is certainly more massive than any terrestrial planet in the system and 12 times as massive as Trosuslia, at 27.3 Earth masses, it really isn't very impressive in the grand scale of things. By comparison, Saturn has 95.2 Earth masses. Nevertheless, it is the most massive planet in the system. Dinuru is largely composed of hydrogen, with the gas accounting for 74% of its total mass. Water is more abundant beyond the habitable zone, and so 19% of its composition is composed of water. All three gas giants of the Arist system have developed ring systems. The rings of Dinuru are almost entirely made of silicates. It should be noted that Dinuru's size—or rather lack of size—is partly responsible for life having a rough start on Trosuslia. In our solar system, Jupiter acts like a cosmic vacuum, diverting potentially hazardous asteroids away from Earth. Dinuru does not have sufficient mass to act as a very effective shielder to Trosuslia. 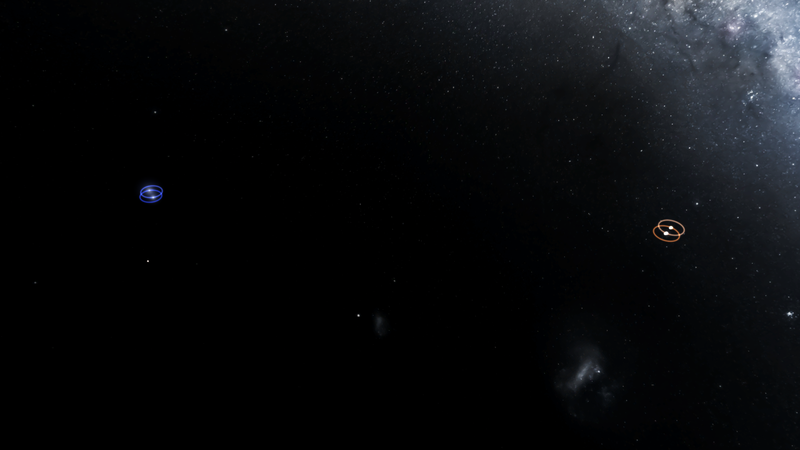 Dinuru boasts 47 moons, the greatest number of moons of any planet in the Arist system. However, only the innermost moons and moons of radius 100 km or greater have been displayed in the simulation. This is to avoid cluttering up the system and slowing down the simulation. At about 1 million kilometres from Diniru orbits Dinuru VII, a moon 2.52 times more massive than our Moon. The tidal forces between it and the gas giant create internal heating and a weak magnetic field to develop, shielding the moon from solar winds. Dinuru VII also lies within Dinuru's magnetic field for a portion of its orbit. Solar wind strips away atmospheric particles, but these shielding factors allow it to retain a relatively thick atmosphere compared to other moons and even some ice on its surface. However, with a temperature of -140°C, it is unlikely for life to develop here. Whereas moons like Europa in the solar system could have an ocean under the ice, the ice for Dinuru VII is thin compared to moons like Europa, meaning there is no ocean for organisms to seek refuge in. The second gaseous planet from Arist is more closely related to Uranus and Neptune than Saturn or Jupiter. At 16.2 Earth masses, it is slightly more massive than Uranus but slightly less massive than Neptune. However, where both Uranus and Neptune are made of more than 80% water, Rotulis has hydrogen and water in more or less equal proportions, allocating it the title of being a hybrid of gas and ice giant. Aside from these characteristics, there's nothing too different here than to Dinuru. Granted, it is certainly colder, with the temperature at Rotulis being -180°C, but the sights and experiences one would expect to see here are quite similar. 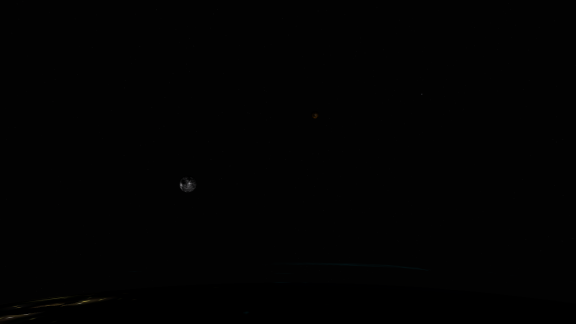 The Rotulis system contains 39 moons. Only the innermost moons and moons of radius 100 km or greater are simulated. 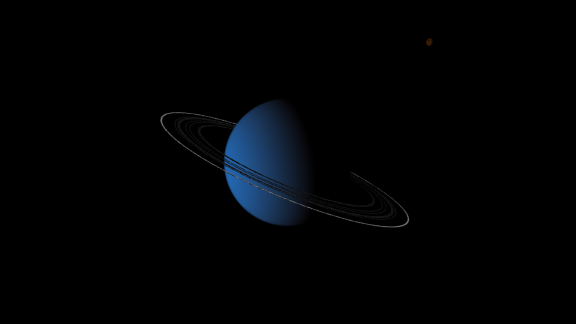 The outermost planet of Arist and also the last of the giant planets is Charilia, and the only true ice giant of the system, with its composition made of 66% water. With a mass of 13.3 Earths, it is less massive than either Uranus or Neptune. However, its high axial tilt gives its system a somewhat analogous appearance to Uranus. Due to the compact nature of the Arist system, Charilia would occupy about the same orbit of Jupiter should it be relocated to our solar system. The Charilia system is heavily shrouded by icy materials. The temperatures of -200°C here allow massive amounts of ice to exist, both in the planet and within its moon systems. Some moons contain an icy crust up to hundreds of kilometres thick, most notably on Charilia VII, VIII and IX. Despite this, it is believed that Charilia offers too little tidal heating to produce liquid water oceans under the crust of ice like on Europa. The ice is likely frozen almost entirely the way through to the mantle of the moons, reducing the chance of marine organisms surviving under the ice. The Charilia system contains 36 moons. Only the innermost moons and moons of radius 100 km or greater are simulated. A number of dwarf planets and minor planets orbit Arist. Of these, there are two notable members in the inner asteroid belt between Trosuslia and Dinuru. Both have a radius of about 500 km. It is believed that the asteroid belt was unable to form an entirely new planet because of gravitational perturbations from Dinuru. This is similar to the case of Jupiter in our solar system. Although Dinuru is less massive than Jupiter, the compact orbits of Arist ensure its gravity still has a role in preventing planet formation around the outer edge of the habitable zone. More dwarf planets exist beyond the orbit of Charilia than in the inner Arist system. This region contains another asteroid belt, analogous to the Kuiper Belt in our solar system. Due to its distance from Arist, objects here are mostly made from icy materials. Only dwarf planets with a radius of 450 km or more are displayed in the simulation. There are hundreds more with radius 100–400km, but adding so many would be a heavy burden on the simulation. Most comets in the Arist system originate from the asteroid belt beyond Charilia. Notable members include Comets Adtel, Eaphus, Uephus and Esmilles. All four are known to produce impressive tails on their close approaches to the star, and all four are periodic comets, capable of being seen more than three times in a human's lifetime. The display of the comets is expected to continue as long as they contain icy volatiles on their surface. Esmilles has the closest orbit to Arist and is expected to exhaust its volatiles first, but not before it completes another few thousand orbits around the star. The Arist system does contain more than these four comets, and even an Oort Cloud far beyond the orbits of the planets. Long period comets from there could take thousands to hundreds of thousands of years to orbit. However, these are not simulated to avoid cluttering. If your device is slow, download the version of the system with no particles. My worldbuilding project after the previous Sorr system is now complete. This system took about a day's worth of total playing time to create, split over the course of a month. While the previous binary system—Sorr—was not a bad creation, I had begun to notice some very unrealistic portions of the creation seeping through. Arist may not be as spectacular in that it does not have two stars, but my ultimate aim in worldbuilding is to build star systems so realistic, you begin to wonder if I replicated an exoplanet system we've already discovered in real life. These systems are certainly fictional and based off of my imagination, but my methodology is to tinker with the system for the longest while, fixing little things until I am satisfied with its realism. Some of these little things you may not even notice. Orbital resonance is included in Arist. Albedo has been taken into consideration. The orbits of planets all have a certain degree of eccentricity and inclination to model the real world. Even the magnetic pole angle has been altered on objects with a magnetic field, despite it not having any effect yet in the game. I'd appreciate any suggestions as to how I may be able to improve future systems beyond this. Not yet. I plan on adding more stuff to it soon like that. The Darkin system was formed around 4 billion years ago. It has two habitable bodies in it's system and a multidue of other rare planets that have never been discovered before. It proves to be a promising system that has potential for a lot of research and possibly future colonization. Tuneme - A planet that is rocky. It has a gray surface that is beautiful due to the molten lava seas on the planet that are all over the planet. It's around 2.66 earth-sized and as well as 943c. Making it the hottest planet in the system. It is also the first planet. Flupi - Rocky planet that has beautiful blues mixed in to grays. It is 20.5 moon sized, making it the smallest in the system. It's temp is 273c. Obius - A desert planet that is 97c. It has an atmosphere and an magnetic sphere. The planet once resided in the habitable zone of the Darkin system but was dragged further out of it in to the red-zone. But as a result. It has not lost it's magnetic sphere or atmosphere. It appears to have an cratered and scratched surface, indicating that the planet had went through a bombardment of meteors or some sort of objects. It once harbored desert life very similar to our own, but different in it's own form. It still does harbor life but most of it has moved deep underground. Invertebrate insect-like creatures reside deep down beneath the surface in the cool underground tunnels of Obius. It's around 55 moon size. Lucifer - A fiery red planet that has an atmosphere and magnetosphere and of course, a fiery-blue ring to go with it. The planet's ground is red, no matter what elevation of the planet and the temp of the planet is no joke either. 118c is the Surface temp. Making it the last hottest planet in the Darkin system, but also the creepiest. Life has not existed on the planet. Deep - A water world that has a surface temp of 19c. A beautiful blue planet when observed and also has a beautiful sunset and sunrise thanks to the blue sun. The planet has an atmosphere and magnetosphere that protects it well from any harm. Life exists on the planet of Deep. With various underwater features such as caves, abysses, coral, etc. It has various life on the planet but the definition of life on the planet Deep is.. horrifying to what we would call "sea-monsters". There are three big predators bigger than the blue whales on Earth and numerous subpredators and the alike on the planet. It is the biggest planet in the system. Dune - A desert moon to Deep. It also has an atmosphere, magnetosphere. It has some oceans flowing around the planet. Alien life exists on the moon in the form of the same giant insects that inhabit Obius and giant worms that hide underground and monkey-like creatures that are possibly in the stages of evolution to become a more sentient species. Retan - A planet that has only one season. Winter. It constantly snows and maintains a temp of 152c. It is the coldest in the system and of course, it has an atmosphere and magnetosphere. It has no life but it's snow is just like Earths. envision a snow-covered earth where it constantly snows. Up to 7 feet of snow lands upon Retan everyday. Jumbo's comet. A comet that comes close to Darkin a lot. It has no other notable features. Wait, 152c? Dont you mean -152c? Yeah my bad. I was trying to go for a Hoth-like planet but make it more earth like. Vernusta system is similar to Sol System, having 1 Earth-like planet with intelligent life. The system is located 553.2 light years away from Sol. A star just like the sun, but it's 140% heavier and 4 times brighter. Temp is 6812K (6538.85°C). Efithra is the first planet in Vernusta system. It's located 138,671,520km(0.93 AU) from Vernusta. It's 2.13 heavier than Earth, radius being 8,133 km. Rotation period is 1.28 years, longer than orbital period (275 days). Due to its close range, Efithra has became hottest planet on the system. Its atmosphere is consisted mostly of carbon dioxide, with few amounts of hydrogen sulfide, methane, and water vapour. As it has the high atmospheric pressure (33.3 atm) surface temp rises up to 430°C. Surface cannot be seen from naked eyes because of thick clouds. The planet was once habitable, but became deadly as Vernusta got hotter over time. 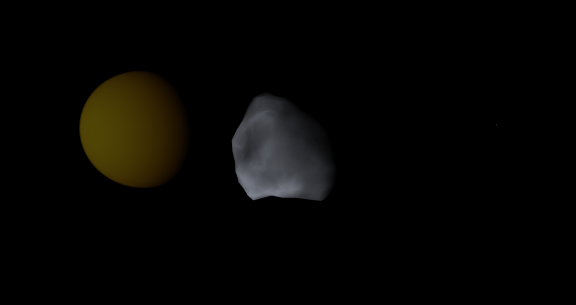 Discita is an asteroid that was originally in asteroid belt, but somehow got captured by Efithra. Mass is 9.83E+17kg, radius 39.2 km, rotational period 342 days, orbital period 1.42 days (located 62,723 km away). Since it's very small Discita is hard to see in Efithra even with a telescope. Some evidence suggests it will merge with Efithra millions of years later. Night, notice the little lights coming out from alien city. Tonitu is the second planet in Vernusta system. Its appearance is very similar to Earth, which comes from the fact that Tonitu IS the second Earth. ESI is 0.912. Tonitu is 1.04 times heavier than Earth, radius 6,490 km, atmospheric pressure 1.02 atm, rotational period 1.10 days, orbital period 3.74 years (located 2.69 AU away). Surface temp is estimated to be about from 23.2°C to 31.2 °C. Its atmosphere is very similar to those on Earth, only exception being Tonitu has more carbon dioxide which can be lethal to lives on Earth. The planet is mostly consisted of rainforests, with extremely large vegetation thanks to high percentage of carbon dioxide. Occasional storms can be seen during summer. Not only it has wild animals and its own ecosystem, this planet also has intelligent aliens similar to mankind. Their heights are slightly small compared to humans since Tonitu's gravity is more stronger. Technology are far more advanced than humans; They're able to travel faster than light with warp drives. They've already colonized some planets beyond Vernusta system. Their cultures are quite similar to humans; each individual has its own free will and able to act themselves. To prohibit themselves from attacking other alien lives, it has strict law to forbid meeting or communicating with any aliens. Tonitu has two moons. Both are heavier and larger than our Luna. Lunev is the first moon of Tonitu. It's 2.36 times heavier than Luna, radius 1,926km, rotational period 189 days, oribtial period 2.96 days, located 91,215km away. Notice the surface being very similar to Lunar. This is because it had a great impact billions of years ago. Because it's relatively large and close to Tonitu, it creates massive tidal waves compared to Earth. This also creates magnetic field of Tonitu as it heats up the planet. Icitianae is the second moon of Tonitu. Not much is known about this moon as it's far away and has no special features. Mass is 1.11 times the Lunar, radius 1617 km, rotational period 215 days, orbital period 7.27 days, located 165,263 km away. Albedo is quite low. Surface is mostly made up with iron oxide, making the moon look reddish. Tascianus is the third and largest planet in the system. This planet's surface is filled 100% with water, aka. the ocean planet. Despite being far away from habitable zone, water can still exist as liquid because of its thick atmosphere. Atmospheric pressure is estimated to be 29.5 atm, surface temperature being about 66.5°C. Mass is 15.5 times Earth, radius 17735 km, rotational period 11.5 hours, orbital period 16.4 years, located 7.21 AU away. It looks peaceful from outside, but you'll change your mind when you actually land on this planet. Because of its super fast rotational speed, a huge storm is frequently happening inside. This storm's wind might tear you apart and even if you survive this the pressure would crush you anyway. This planet has no life at all because of hot temperature and stormy weather. Tascianus originally had 5 moons, but only 2 survived as all other moons came too close to Tascianus and were ripped into pieces. A gigantic ring was formed during this event. 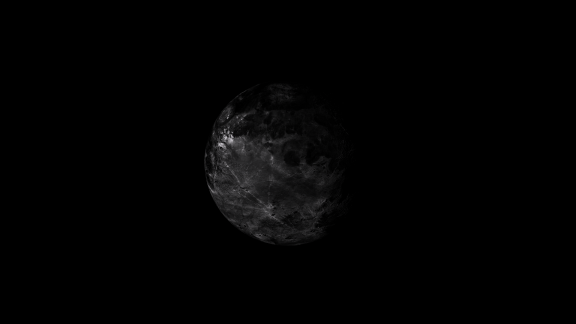 Climanqu is the first moon of Tascianus. 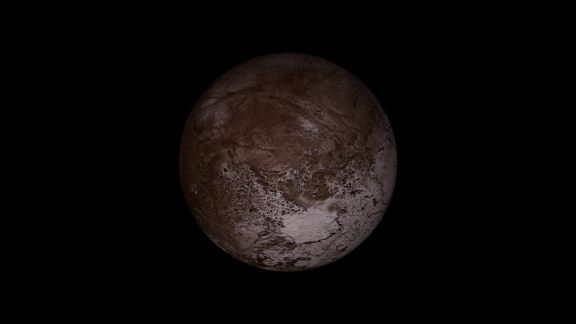 It's appearance is very similar to Jupiter's Europa and Neptune's Triton. Mass is 2.72 times Lunar, radius 1,866 km, rotational period 344 days, orbital period 2.12 days, located 173,844 km away. Tascianus has massive gravity and heats up this moon. Water might exist under the icy surface because of this. Fitiapi is the second moon of Tascianus. It's very large compared to other moons on the system. Mass is 67.9 times moon, radius 5,353 km, rotational period 228 days, orbital period 10.4 days, located 511,097 km away. Also notice the red atmosphere that makes up the moon. Atmospheric pressure is estimated to be about 1.02 atm, even stronger than Earth's. This is possible since its surface temp is very low (-106 °C). Atmosphere is mostly consisted of nitrogen, carbon dioxide and very few amounts of helium. Fitiapi has its own magnetic field. I've attached the simulation below. Note: there is also asteroid belt and comet cloud, but got rid of it since it makes the system to look ugly + I'm too lazy to explain all of it. Keep in mind that all planets' data are modified and it's not possible to have thick atmosphere or night side lights when created randomly. 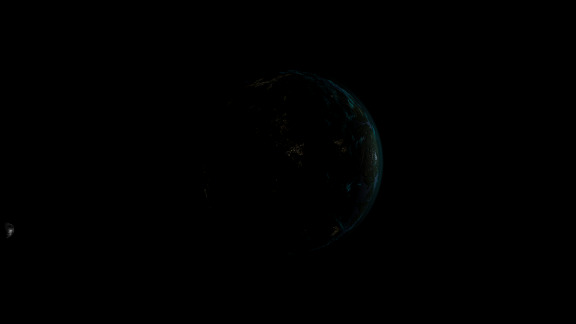 Also night side lights are somewhat missing in actual simulation, idk why this happens but will try to fix it. Orbits are quite unstable so be careful when you accelerate time. Some planets and moons can be different from this post, maybe I'll fix it. Very nice build Vapor. Would you be able to inform me how you've modified those objects? I've tried opening the planet files but it comes up as a jumble of text. This is something I've always wanted to do to improve my systems' realism but didn't know how. Well I am actually planning to create a new topic about editing objects. It's not that hard. All you need to do is to save object and tweak body.json with notepad! Simple huh? Anyway I'm still not sure about some functions and have to investigate on it. I'll talk about this soon. Pneumake A is the brightest and most massive star in the whole system. It's a B-type blue giant with 8.23x the mass of the sun, and it is 13,000x brighter than the sun. Since it is the most masssive star, it is currently undergoing significant mass loss, and will go supernova in a little over 10 million years. Pneumake B is the second brightest and most massive star in the whole system, seperated 152 AU away from Pneumake A. It is a B-type main sequence star with the mass of around 2.02 suns. 1. Atheia - A rocky, habitable planet 3 times more massive than earth, with an average surface temperature of 40°C. Because it orbits so closely to the red dwarf, the planet is tidally locked, but thanks to the nearby Pneumake A and B, day and night would still exist. Atheia is protected from Pneumake A's stellar winds by a strong magnetosphere, which prevents its atmosphere from eroding away, thus allowing complex multicellular lifeforms to develop on its surface. 2. Iberi - A cold, barren, uninhabitable rocky planet with 1.4x the mass of earth. It orbits too far away from Pneumake C, and the temperature can go as low as -180°C. The Victolfian system is where most of the planets are. The system is over 1 billion years old, much older than Pneumake. This is because the system is actually a captured binary system. Life had developed in many of the planets long before it even got captured. Victolfia A is an F-type main-sequence star with 1.3x the mass of the sun. It contains 11 planets and 6 asteroid belt objects. 1. Zaynella - A moderately sized rocky planet with 55x the mass of earth's moon. It is the closest planet to the star, and it is also tidally locked. Average temperature is 440°C, rendering it uninhabitable. 2. 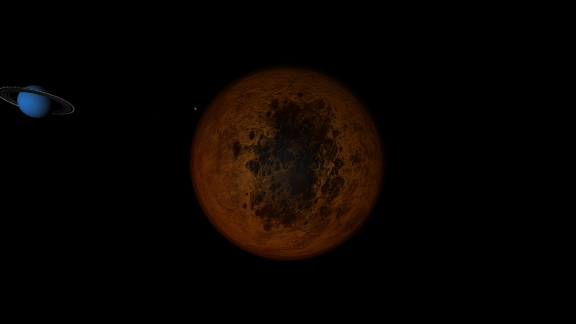 Kasmaar - A rocky planet with 71x the mass of earth's moon. It rotates clockwise, just like Venus, but instead of rotating once every 116 days, it rotates once every 8 days and 8 hours. Average temperature is 320°C. 4. Kartorigin - A large rocky planet with the mass of 1.2 earths. Average temperature is 122°C, however, microorganisms have been found living in the craters. 7. Erden - A massive rocky planet 2.5x larger than earth. The planet is very similar to earth, with dense green rainforests scattered across the planet. Coupled with an average temperature of 24°C, the planet is definitely a wildlife haven. Millions of species can be found on this planet, one of them, dubbed the "Victolfian race", had discovered fire and can create simple stone tools. But they are still far less developed and more primitive than humans. Erden has 3 moons, Ultima, Irebi, and Afronach. 8. Athena - A super-earth water-world planet 4x the mass earth. It is covered entirely by an ocean over two thousand kilometers deep. millions of different types of marine species can be found here. Average temperature is 16°C. It has 3 moons, Potland, Tashia, and Diana. 9. Rinjani - A cold, icy planet 3x more massive than earth. Like Athena, it is covered entirely by water, but due to its lack of atmosphere, and the fact that it lies beyond the habitable zone, temperature falls to as low as -90°C. However, it is theorized that liquid water can exist hundreds of kilometers below the surface, thanks to its geothermal activities, allowing simple lifeforms to develop, similar to Jupiter's Europa. 10. Amelia - A gas giant 53x the mass of earth. Average temperature is -186°C. It has 7 moons, Listasch, Crainer, Kornera, Ross, Colcapp, Endermark, and Scitia. 1. Almatia - A small but dense rocky planet at 21x the mass of earth's moon. It is the closest planet to Victolfia B, and is also tidally locked. Because it is so unusually dense, it has a surface gravity similar to earth, at 8.25 m/s^2. Average temperature is 510°C. 3. Ophelia - A moderately sized rocky planet with 33.4x the mass of earth's moon. Due to its extremely high albedo, the average temperature is -32°C, which is really weird for being really close to Victolfia B. 4. 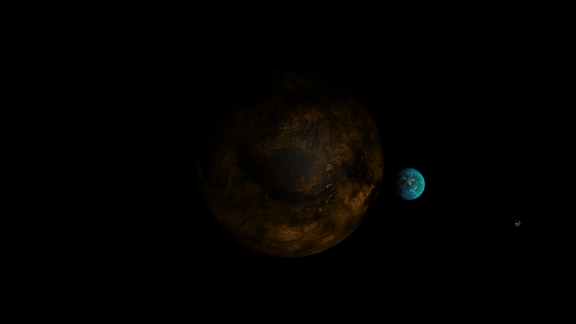 Dagon - A super-earth water-world planet nearly 4x the mass of earth. Like Athena, it is covered entire by water, thousands of kilometers deep, with thousands of marine species. It has one moon, Hustanmastiff. 5. Thestias - An extremely massive rocky planet 3x the mass of earth. Like Erden, it is very similar to earth, with a moderate temperature of 27°C, lush green rainforests, millions of different types of species, and its own ecosystem. It has one moon, Ucinus. 6. Arion - The most massive planet in Victolfia B's system, at 249x the mass of earth. Average temperature is -215°C. It has 9 moons, Aeger, Galvanon, Farensia, Pathen, Kara, Mangine, Theatra, Alluria, and Edon. 7. Hypothena - A gas giant 37x the mass of earth. Average temperature is -202°C. It has 4 moons, Starvina, Utortia, Vulcan, and Naeman. I've attached to simulations, one with particles, and one without. If you have a slower computer, consider downloading the one without the particles, keep in mind that the asteroid belts will disappear, and you'll be left with just the asteroid belt objects. It seems to be getting a new creation about very month or so. That's alive enough. I remember long ago there were like 2-3 submissions every week. What happened? Also please make sure that you keep it under 30 min per sec; If you turn it up too much it glitches out and Alpha Centauri B and Proxima Centauri fly out of the Solarac - Centauri System. Another System I call The Rainbow System! Plus some Other systems like the Sun with Nemesis and Terraformed Mars. It has all the different types of planets! It is at the bottom! The 1SWAPS J1407 System, the one that holds J1407b, Dubbed Super Saturn, the one with the rings 200X Saturn's look here! The Restner Open Cluster is a really compact, open cluster consisting of 60 stars all orbiting one another within a space of just 10.2 light years across. The cluster itself 32 million years old. Most of these stars are given name by myself, while some are randomly generated, and as you can see, I'm terrible at naming things. Some of these stars have planets in them, 38 total, discover them by yourself...! I suggest that, unless you have a really beefy computer, you DO NOT zoom in really closely to any of these planets, it will cause really huge lags. Arjuna A is the largest star. It is a A-type, main-sequence star 1.8x more massive than Sol, and 25x brighter. 1. Lahar, the closest planet to the star. The planet is a tad bit more massive than Earth, but smaller than Earth. Lahar's surface temperature is 259°C. It has a yellowish surface, possibly due to the rusting iron and dust mixed with a lot of sulfur. - Ijen I, 2.72x the mass of Earth's Moon. It has a yellowish-orange surface, with occasional volcanic eruptions. It has an unusually eccentric orbit, at 0.7. - Borneo I, slightly smaller than Earth's Moon, at 0.7x. The surface temperature is 16°C, but no life has been found on its surface. - Borneo II, a moon similar to Earth's Moon in terms of mass. It is slightly colder, at 10°C, but frozen waters can be found on its craters, especially around the poles.